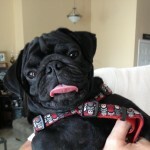 Buddah - Available for Adoption! Hi Im Buddha! Im a 5 1/2 month old puppy who is laid back, playful, and ready for a new furever home! I had to be surrendered by my family due to allergies and they were very sad to see me go. Id love another young pug to play with and a couple of kids as well. Im quite the catch, im crate trained, housetrained. You better get your application in quick, im a keeper!